In the mid 1980s, Canon set itself an ambitious goal: to build the ultimate SLR camera system. EOS began with a momentous break from the past, as Canon moved away from their established range of FD lenses to the new EF (Electro-focus) lens mount. The launch of EOS was a major statement on the part of Canon – and a gamble. Would photographers be willing to leave their old system cameras and lenses behind and upgrade to EOS? The answer caught even the most optimistic industry observers by surprise. EOS cameras and the EF range of lenses triggered a sales avalanche for their manufacturer, and a revolution in SLR photography. Over the next 20 years, EOS would become the world’s most successful and popular SLR system. This is the story of EOS - the ultimate camera system. March 1987 saw the launch of the EOS 650. The camera was the first to be launched with the Electro-Focus (EF) lens mount. In a move that would later be copied by all other manufacturers, the EOS 650 - and every subsequent EOS camera - replaced the mechanical links and levers between the camera and the lens in favour of a fully electronic configuration. The new EF mount had the largest internal mount diameter (54mm) of all 35mm SLR cameras, allowing for larger aperture lenses. 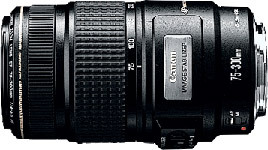 One of the early EF lens range innovations was the Ultrasonic Motor (USM). Canon had previously manufactured auto focus lenses for their FD camera system, but the lenses were bulky and the auto-focus action relatively slow. With USM, Canon developed a way of using vibrating piezoelectric elements to create a drive mechanism that would power auto focus. USM allowed faster, more accurate and virtually silent auto focus while also allowing manual focus override. With this revolutionary advantage, EF lenses soon won renown for their auto focus capability. With its 5.5 fps shooting speed and auto focus accuracy, Canon’s first ‘1’ series camera - the EOS-1 - firmly established EOS as the market leader amongst professional news, sports and fashion photographers. By giving the camera the ability to sense base lines on both the horizontal and vertical planes, the EOS-1’s Cross-type BASIS (Base-Stored Image Sensor) sensor allowed the camera to focus automatically with unprecedented accuracy on a vastly greater variety of subjects than was previously possible. The knowledge gained from BASIS sensor research would provide invaluable during the development of the company’s CMOS sensor technology, now driving the success of Canon’s D-SLR range. At the time, Canon’s engineers foresaw that an eventual move to digital capture would require development of an imaging sensor. Developing the BASIS sensor set the foundations for Canon’s in-house development of CMOS almost a decade later. Canon manufacturers not only its CMOS sensors, but also the stepping machines that make the sensors. This unique position allows Canon to maintain far tighter controls over quality than would be possible with off-the-shelf sensors bought from third party manufacturers. The EOS-1 was released simultaneously with two new lenses in the Luxury L-series of EF lenses – the EF 50mm f/1.0L USM and the EF 80-200mm f/2.8L USM. Representing the pinnacle of operability, robustness and image quality, L-series lenses were to establish themselves as the choice for professionals. Overcoming the limits of conventional optical glass, ‘L’-series lenses were to develop over time to feature special optical materials such as fluorite, ultra-low dispersion (UD) and super UD elements for uncompromising image quality. 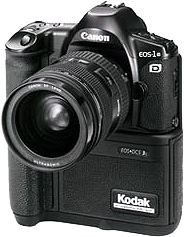 The EOS RT was a specialty camera with a fixed pellicle mirror. In contrast to a standard SLR camera, where the mirror moves within the camera as the exposure is taken, the mirror within the EOS RT remained stationary, allowing a shutter delay of just 0.008 seconds. The EOS RT gave photographers the ability to track objects in ‘Real Time,’ making the camera particularly suitable for sports and wildlife photography. Priced under €1,000 at its launch, the EOS 1000 opened up EOS photography to a much wider audience than before. It featured One-Shot AF and AI Servo AF modes, along with the standard exposure modes found on other, higher end EOS cameras. Compact, affordable and fully featured, the EOS 1000 proved a massive hit with amateur photographers around the globe. 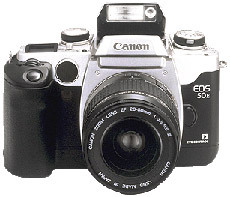 In November 1992, the EOS 5 introduced Eye-Controlled Focus: an innovation from Canon that generated great interest. The Eye-Control BASIS sensor tracked the position of the user’s pupil. The point the user was looking at was then selected as the focusing point and focus was automatically achieved. The system offered useful features beyond focusing – for example, a depth of field preview could be enabled by looking to the top left corner of the viewfinder. July 1995 saw the debut of Digital EOS. With a 1.3 Megapixel CCD sensor and a price tag of 12,000 euro, the EOS DCS 3 opened a new chapter in the EOS story by giving photographic agencies the ability to produce transmission-ready images straight out of the camera. Fully compatible with the entire range of EF lenses, the EOS DCS 3 was developed in collaboration with Kodak, who produced the major electronic components. Later developments in the Digital EOS range would see Canon bring the design and manufacture of all key components in-house, including CMOS image sensors and the unique DIGIC image processor. By this point in the EOS story, more than 60 EF lenses had been released. 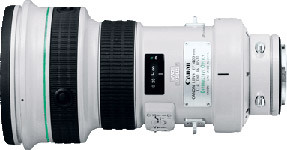 A key step in the development of the range occurred in September 1995 with the debut of the EF 75-300mm f/4-5.6 IS USM – the first EF lens with a built-in optical Image Stabilizer (IS) to reduce camera shake. In an IS lens, optical shake is detected by two gyro sensors which provide data to a compensating lens mechanism that neutralises movement off the optical axis. Perhaps the most impressive feature of the Image Stabilizer is that it copes not only with shake caused by hand-holding the camera (generally around three to five movements per second) but also vibrations up to 20,000 Hz – enough to compensate car engine or even helicopter vibrations. Positioning the IS technology within the lens rather than with in-camera components and software offered several advantages. For one, the EF lens mount is optimised for a 35mm film frame. Using an in-camera system based on moving the sensor would have required a larger image circle and therefore a larger lens mount. Also, with lens-based IS the stable image is visible to photographers as they shoot, not just in the resulting image. Another major benefit is that the IS unit can be fine-tuned for each specific lens, ensuring optimum performance. 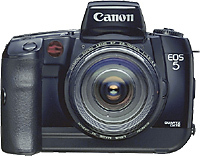 September 1995 saw the debut of the EOS 50E with E-TTL (Evaluative Through-The-Lens), Canon’s advanced light metering system. In contrast to the previous metering system, A TTL, E-TTL employed the same evaluative metering sensor used for ambient metering. It metered through the lens, making it harder to fool than external sensors and less likely to be confused by reflected light. E-TTL’s highly accurate reading took into account the ambient light reading, pre-flash reading and focusing point-weighted reading. 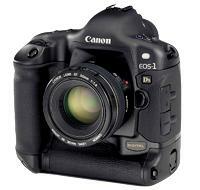 E-TTL has subsequently been replaced in all EOS cameras with the enhanced E-TTL II. The EOS-3 heralded a major step in the development of Canon’s AF sensor technology – 45-Point Area AF. 45 auto focus points are packed into an ellipse covering about 23 percent of the viewfinder screen, allowing for a new level of focus accuracy and speed. Eye-controlled Focus was upgraded for use with the 45-Point Area AF of the EOS 3. Powered by new algorithms, 45-Point Area AF gave the user a much larger zone to focus by eye: up to 5 times larger than on previous EOS cameras. 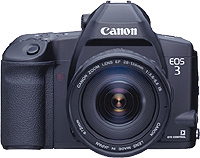 Released in April 1999, the EOS 300 was the firmly targeted at the emerging consumer SLR market. Focused on ease of use, the EOS 300 featured a seven-point AF system with AIM (Advanced Integrated Multipoint) metering, which linked exposure to the seven AF points for greater precision. The EOS 300 opened up the full possibilities of the EOS system to the beginning photographer. 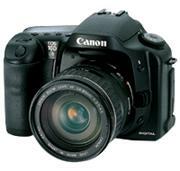 Its low price point (around €400) and advanced features contributed to the camera becoming one of the best selling analogue models in EOS history. 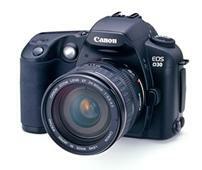 The EOS D30 signalled the future direction for Canon’s EOS development. The EOS D30 was the first Digital EOS with all key components wholly manufactured by Canon, including the 3.11 Megapixel CMOS image sensor. Although CMOS technology had been previously used by Canon in the development of its AF and metering sensors, this was the first time it had been used for the imaging sensor. Delivering wide dynamic range, lower power consumption and lower noise, CMOS would become a core EOS technology and one of Canon’s key competitive advantages. The EF 400mm f/4 DO IS USM lens signals one of the most exciting innovations in EF lens design. The breakthrough DO (Diffractive Optical Element) lens has a multi-layer construction consisting of two single-layer diffractive optical elements that counteracts virtually all chromatic aberration. Not only is the imaging performance of the lens improved, but the technology allows considerably smaller and lighter lenses. The first professional ‘1’ series Digital EOS designed for sports and news photographers, the EOS-1D featured a 4 Megapixel CCD sensor and a shutter release lag-time of just 55 milliseconds. Its 8 frame per second shooting speed propelled digital EOS into the world’s major sporting events, a position maintained ever since: over 70% of registered photographers at the Athens Olympics shot on EOS. 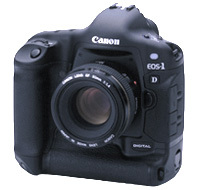 The EOS-1Ds represented a massive breakthrough in Canon’s development of CMOS for the EOS system. Offering 11.1 Megapixels of resolution, the sensor’s 23.8 x 35.8 mm size gave it dimensions similar to full frame 35mm film SLRs. Full frame CMOS has three distinct advantages over smaller sensors. Firstly, the larger sensor means that individual pixels can be larger while total pixel count is maintained. Larger pixels are more sensitive and have a wider dynamic range for better detail, particularly noticeable in deep shadow and highlight areas. They also have a better S/N ratio for noise free performance, especially at high ISO speeds. Secondly, the entire 35mm format – and therefore the complete EOS system – is based around full frame photography. Shooting with less than a full frame sensor effectively crops the image, reducing the area that appears in the photograph. Only a full frame sensor allows photographers to get the most from their wide-angle lenses. Finally, the photographer’s view through the viewfinder is larger and brighter than with smaller sensor cameras – a feature of particular relevance to many professional photographers used to the 35mm format. 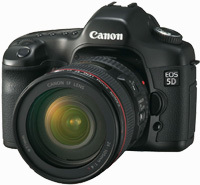 The EOS 10D saw the debut of Canon’s proprietary DIGIC (DIGital Integrated Circuit) image processor in an EOS camera. DIGIC offered exceptional processing speed, on-chip noise reduction and fast buffering, enabling new degrees of speed and shooting flexibility. The chip controlled all key functions of the camera, allowing for faster response times. DIGIC also allowed the user to simultaneously capture RAW and JPEG files for both fast review and distribution of images, as well as greater post-production flexibility. In September 2003, the EOS 300D exploded onto the market, creating a new category of consumer D-SLR owners. Pitched at the exceptionally low price point of under €1,000, the 6.3 Megapixel camera proved to be a huge hit and sold over 1.2 million units world wide by January 2005. The launch of the EOS 300D also saw the debut of the new EF-S lens mount, the ‘S’ standing for ‘Short-back Focus,’ due to the fact that rear element of the lens is closer to the image sensor than in a regular SLR. Whilst the EOS 300D was fully compatible with the existing EF lens range, the new lens mount allowed for smaller, lighter and less expensive wide-angle lenses,. 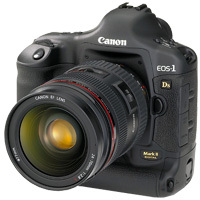 In April 2004, Canon released the EOS-1D Mark II, offering phenomenal performance for sports and action photographers. With a continuous shooting speed of 8.5fps, the camera was powered by the new DIGIC II image processor, giving the EOS-1D Mark II the capacity to handle the massive amounts of image data captured by its 8.2 Megapixel CMOS image sensor. EOS-1D Mark II also introduced the new E-TTL II flash metering system, now featured across all models in the current EOS range. An update to the original E-TTL flash algorithms, E-TTL II incorporates lens distance information in its calculation to assist in determining an approximate guide number for flash output. No longer exclusively linked to the AF system, E-TTL II compares the ambient and the pre-flash light levels of the scene to determine where the subject lies. The photographer is therefore able to lock focus and recompose the scene without confusing the flash metering system. Released just 7 months after the EOS-1D Mark II, the EOS-1Ds Mark II set a new benchmark in 35mm format image quality, cementing Digital EOS in the domain of commercial and fashion photographers. The 16.7 Megapixel full frame CMOS image sensor produced files that convert to the 50MB uncompressed TIFF at 24 bit colour depth: the standard required by many leading international photo agencies. With a 4fps continuous shooting speed for up to 32 frames – a speed made possible by the processing power of DIGIC II – the EOS-1Ds Mark II redefined performance in the digital age. According to many critics, the image quality of the EOS-1Ds Mark II not only surpassed that of 35mm film, it challenged that of medium format. 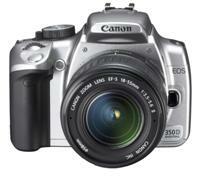 In March 2005, Canon followed up the success of the EOS 300D with the release of the EOS 350D. The 8 Megapixel camera brought new EOS technologies to the consumer for the first time, including the professional architecture of DIGIC II and the flash exposure capabilities of E TTL II. Compatible with the complete range of more than 60 EF and EF-S lenses as well as the EX Speedlite flash range, the EOS 350D gave consumers the opportunity to exploit the full capabilities of the EOS system. Its high spec/low price combination helped the EOS 350D become the fastest selling D-SLR camera of all time. In October 2005, Canon created a new class of D-SLR by offering full frame CMOS in a compact body. Designed with photojournalists and travel photographers in mind, the 12.8 Megapixel EOS 5D delivers outstanding full frame imaging quality in a discretely compact body weighing just 810 grams. With D-SLR photography approaching mass market, acceptance, Canon released a further addition to the consumer end of the EOS range, the EOS 400D. The 10.1 Megapixel camera was the first to feature the EOS Integrated Cleaning System – a comprehensive system to reduce, repel and remove dust from the image sensor. 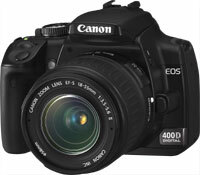 The EOS 400D replaced the EOS 350D as the fastest selling SLR camera of all time. 20 years after the birth of EOS, Canon takes another leap forward. 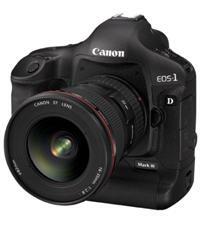 The EOS-1D Mark III represents the accumulation of two decades of EOS technology. In developing the camera, Canon’s engineers reevaluated every performance feature to achieve the ultimate in speed, image quality and usability. Delivering 10.1 Megapixel images at an unprecedented 10 frames per second, it replaces the EOS-1D Mark II N as the world’s fastest D-SLR. Setting new standards for professional photographic equipment, the EOS-1D Mark III signals the next era in the evolution of EOS.